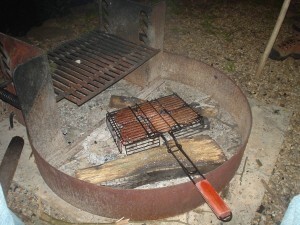 The next time you go camping be sure to take your fish grilling basket with you. I have used this thing to grill not only fish, but also steak, hamburgers, and even shish kabobs. Be sure to start the fire earlier than you would start a charcoal fire because it will take a while to burn down to coals that are right for cooking. I like to lay two logs side by side along the coals to have a space to rest the basket.